Cake! Yum! This is the tastiest part of your wedding day, and the part many of your guests look forward to. It's important to find a cake that expresses your wedding décor, feeds all your guests and tastes the way you want it. Here is a guide to finding your perfect wedding cake. · Give yourself lots of time to find the cake. Four to six months is a good timeframe. · Visit as many cake makers as possible. You'll have to make an appointment for tastings. Some vendors will charge for this, others won't. Some bakers have group tastings; others do individual appointments. · One appointment may involve tasting icing and cake types. · Another appointment may involve the actual decoration of the cake. · Ask for references. Call these people and check on their satisfaction with the baker you are considering. · Try as many different options as possible. You may never know what you will like. Even if it sounds weird, try some of the more unique flavors. · Don't choose a cake based on what the baker wants you to have. Choose your cake based on your tastes. · Ask about getting different flavors in the different layers. You and your groom may not agree on flavors. This compromise is easily accommodated by most bakers. · Ask to see photos of cakes the baker has baked in the past. · Bring in pictures of cakes you like. This will help explain the decoration you are seeking. · Bring in any pieces such as cake toppers you want to include in the overall design. · Ask about how the cake will be delivered or if it will be delivered. Is there a delivery charge? · Ask how it will be displayed. Ask about cake stands and cutters. You may be required to rent these. · Most cakes are priced by the slice. Ask about the number of slices in the cakes you like. · Tell the baker your budget. A good baker and businessperson will make suggestions on getting the best bang for your buck. · Ask about how busy your baker is and how much lead time they will need on preparing your cake. · The groom's cake should be something special that reflects his personality. · Use his football jersey number or his favorite college team in the décor. · Does he play the guitar? A guitar-shaped cake is a unique style. · Does he like golf? Create a golf scene on the cake. 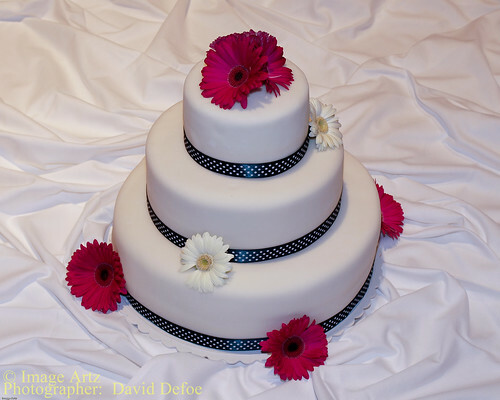 · The groom's cake does not have to be as big as the wedding cake. A single sheet is ideal for an average size wedding. · If he likes chocolate, go for chocolate. If he likes red velvet, go for red velvet. · Keep the groom's cake a surprise. It will make the reception more special if he doesn't know what you decided to do for his cake. · Have fun picking something out that will impress your husband-to-be.